Bell , A. and Everhart, M.J. 2011. Remains of small ornithurine birds from a Late Cretaceous (Cenomanian) microsite in Russell County, north-central Kansas. Kansas Academy of Science, Transactions 114(1-2):115-123. 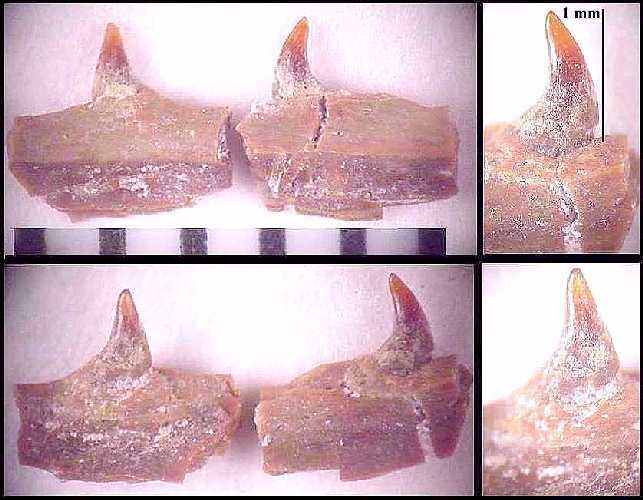 The two small teeth and associated jaw fragments shown in the above and following photographs were hand-picked from a calcarinite matrix using a binocular microscope from a 1-3 cm layer at the base of the Lincoln Limestone Member of the Greenhorn Limestone Formation (marine, Upper Cretaceous) in Russell County, Kansas. The fragments are each about 2.5 mm in length; the tooth crowns are about 1 mm in height. The matrix is mostly poorly cemented "inoceramite. 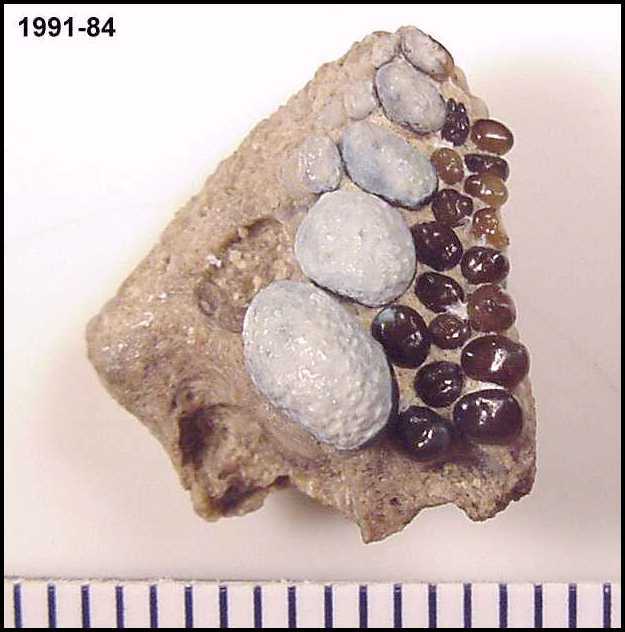 "(1) The fragments apparently came from the same jaw but do not fit together. The teeth are flattened, with expanded bases, and are set in definite sockets. In appearance, the teeth are very similar to those of the toothed bird, Ichthyornis, but are somewhat smaller. Most of the vertebrate remains found to date in this locality are shark teeth, including Squalicorax falcatus, Cretoxyrhina mantelli, Cretalamna appendiculata, and several Ptychodontids. 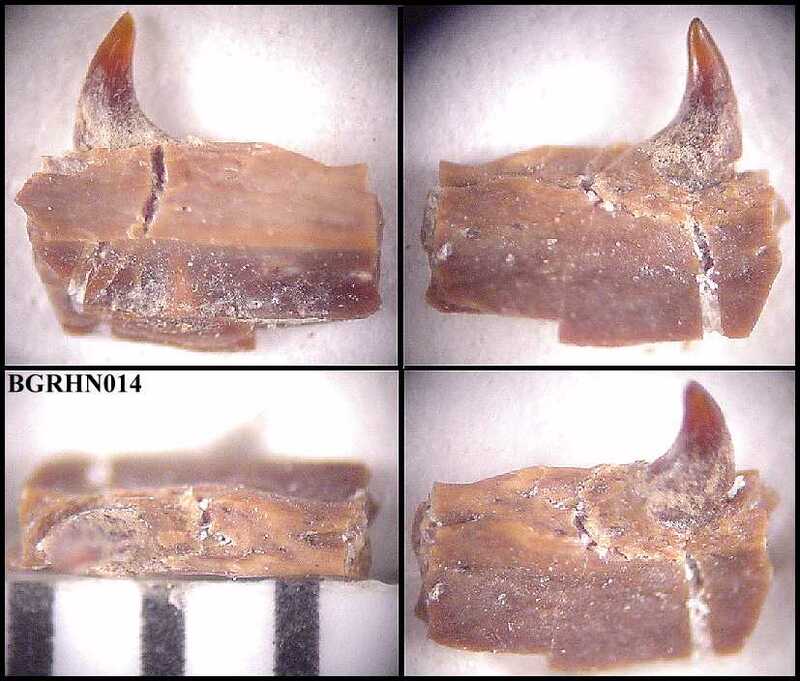 There also micro-vertebrate teeth of various sharks present: (Carcharias amonensis, Scyliorhinus sp. and Rhinobatos incertus). 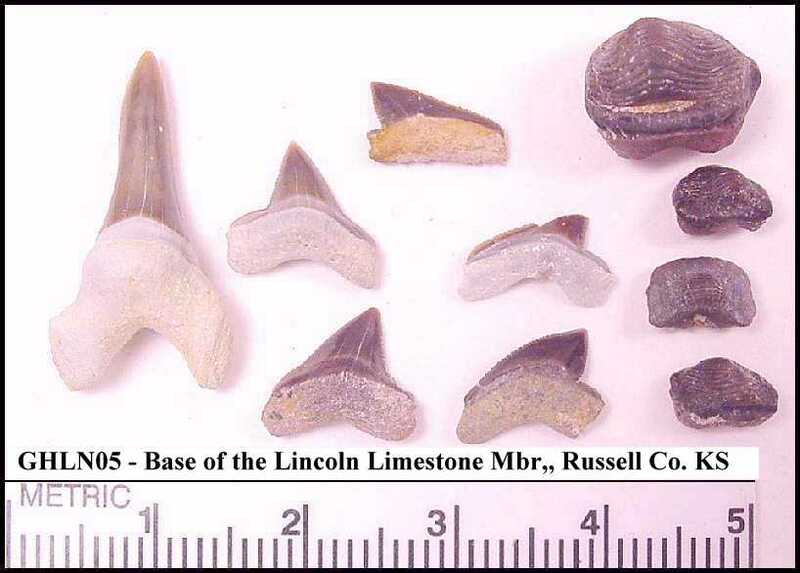 The teeth of bony fish such as Enchodus, Ichthyodectes ? and Xiphactinus are also present, along with a prearticular of a pycnodont, similar to this one (Micropycnodon kansasensis). Several small reptile vertebrae have been found and are attributed to Coniasaurus. A similar fauna was described by Liggett, et al., (1997). The age is earliest Late Cenomanian. The basal Greenhorn rests non-conformably on the Middle Cenomanian age Graneros Shale. Bell , A. and Everhart, M.J. 2011. Remains of small ornithurine birds from a Late Cretaceous (Cenomanian) microsite in Russell County , north-central Kansas . Kansas Academy of Science, Transactions 114(1-2):115-123. Hattin, D. E., 1977. Stratigraphy and Depositional Environment of Greenhorn Limestone (Upper Cretaceous) of Kansas. Kansas Geological Survey Bulletin 209, 128 p., 1 pl.